This blog goes heavy on the dessert, that's no lie. But I do, in fact, eat dinner and I enjoy adding new things to my repertoire so that I don't fall back to the same couple of things (hello, soft shell turkey tacos, I'm talking to you). Earlier this year, I discovered the blog Fit Bottomed Girls and their sister site Fit Bottomed Eats. It's my attempt to balance all the blogs that I follow that have the words cookies, chocolate, wine and baker in them. And that's where I found this recipe to bake a healthier egg roll. And then went on to adapt it based on the contents of my fridge. If I was going to pick a fried app at an Asian restaurant, I'd probably steer towards crab rangoon. Real traditional with all the cream cheese (with a C) and krab (with a K), right? This recipe is a great way to use up veggies and protein in your fridge. Rather than buying shredded carrots, I just sliced baby carrots into smaller pieces. Now the cabbage? That I bought as a slaw mix in the produce section. My protein of choice for this inaugural roll of the egg was pulled pork. Preheat oven to 400. Line your baking sheet with a silicone baking mat. 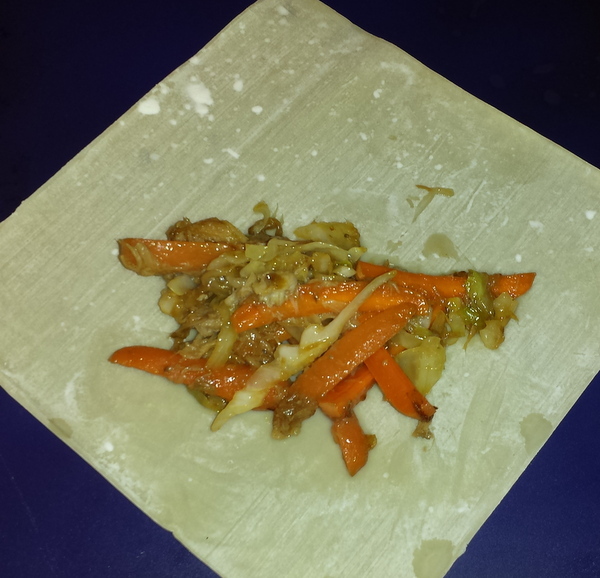 Place two heaping tablespoons of filling on the egg roll wrapper - closer to you, rather than in the exact middle. Fold the bottom towards the top. 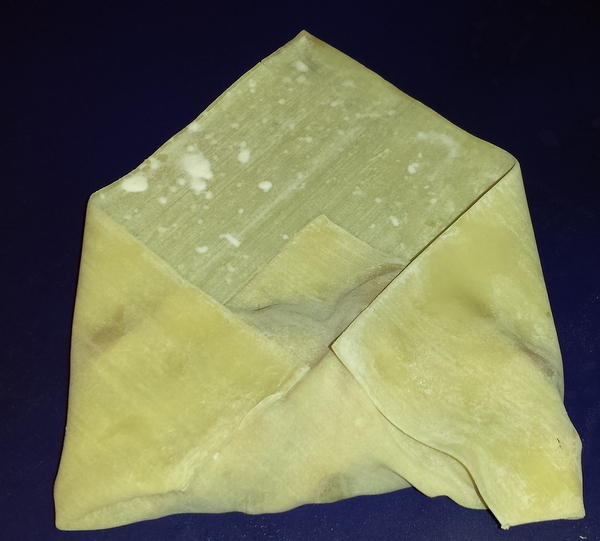 Then fold in the right and left sides. See? It looks like an envelope. An envelope of awesome, that is. Then roll the bottom of the "envelope" toward the top. Place your egg rolls on the baking sheet seam side down and lightly spray with cooking spray to help the wrapper brown. Bake for 10 minutes, then flip them over and bake for another 7-10 minutes until they have reached the ideal crispiness. I love sweet chili sauce, so that was my dip of choice for these crispy rolls. Have you tried to make something recently that's out of your normal routine? How did it go?